Youve Been Reviewed: Unchaperoned adults spotted at Magic Kingdom. Caution not advised. Unchaperoned adults spotted at Magic Kingdom. Caution not advised. Adults in the Magic Kingdom? No, it's not against the rules. It's just plain fun. 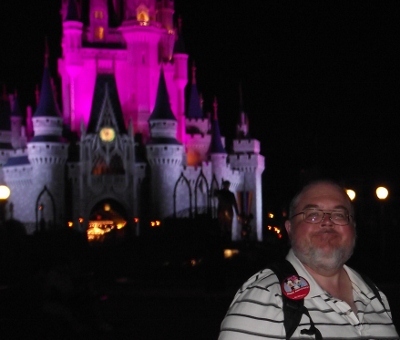 Hubby and I thoroughly enjoyed ourselves when we went to Walt Disney World. We relished in being unchaperoned adults in the Magic Kingdom. I think we did everything that would have embarrassed our kids had they been with us. It was probably good that we made them stay home. It goes without saying that we rode the monorail, boat and buses. These the primary modes of transportation at WDW. 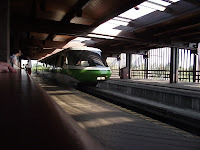 Plus, the monorail is a good place to cool off in the afternoon and pause before going non-stop at the park again. this great shot of the monorail! Another good spot to to enjoy is a new show in the Magic Kingdom. It has to be the funniest show that I've seen in a long time. I'm talking about the Monster's Inc. Laugh Floor. Animated characters interact with the audience throughout the show and use jokes that are submitted by audience members. The idea is that laughter is more powerful than screams. Laughter is collected in a 'laugh can' to power the show. It's a really cute concept that works. After this we decided to relax by riding the Tomorrowland Transit Authority. This calm ride is about two stories above the ground. The ride seemed to last a few minutes and it gives a good view of the park. At one point is passes calmly through Space Mountain which is kind of cool. Hubby and I also had to see the Carousel of Progress at the Magic Kingdom. This is the first animatronic shows to come to life at Walt Disney World. Each season is set in a different time period from the 1900s to current day. Technologically, it's amazing to see how advanced the various innovations have come. Wishes is the closing show at Magic Kingdom. We could see it pretty well from the front porch of the Crystal Palace. This is one amazing show. Photographers stroll through Walt Disney World to take photos of guests. These can be purchased later but are used during the Wishes presentation. We're talking hundreds of thousands of photos are used in the show. The castle literally comes to life. I was spellbound. Our day ended with dinner at the Crystal Palace. The buffet restaurant is a character dining experience. The food is good but you won't want to eat. If you love the 'Hundred Acre Wood' this is the place to be. Characters and a helper stop by each table for photos every few minutes. If you miss them once don't worry. They'll be around again shortly. These adults will too if Hubby has anything to say about it. See you at the Magic Kingdom in Walt Disney World again sometime!